Our program has small classrooms with well trained teachers in order to provide close and individualized attention to every student. We have 2 inclusive classrooms and 2 high level specials education classrooms. Inclusive classrooms are led by a lead teacher and an assistant teacher, and have 22-24 students. Some inclusion classes may also have additional staff to support the needs of students. The two small high level special education classrooms have a lead teacher, two assistant teachers, and dedicated aides as needed and ideally 8 students. 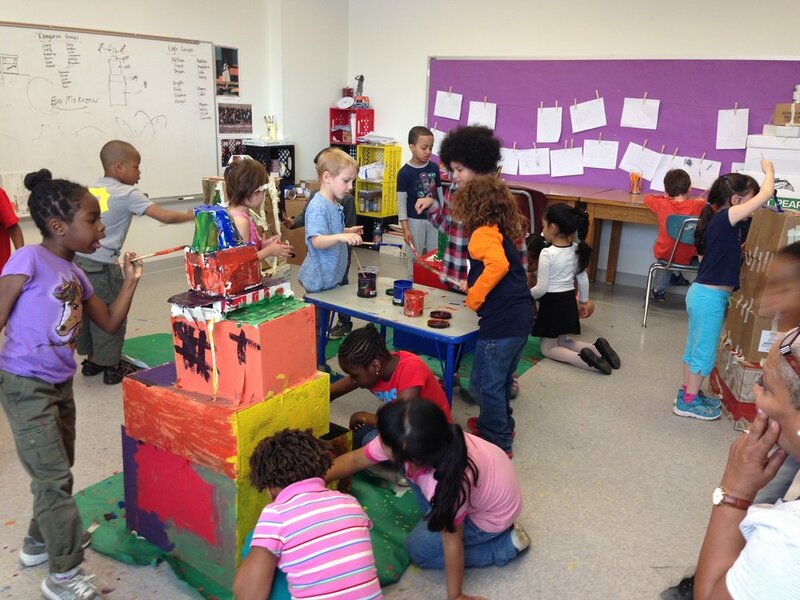 As a natural extension of the project-based studies in Pre-K, Kindergarten continues exploration and a constructivist approach for Social Studies and Science. 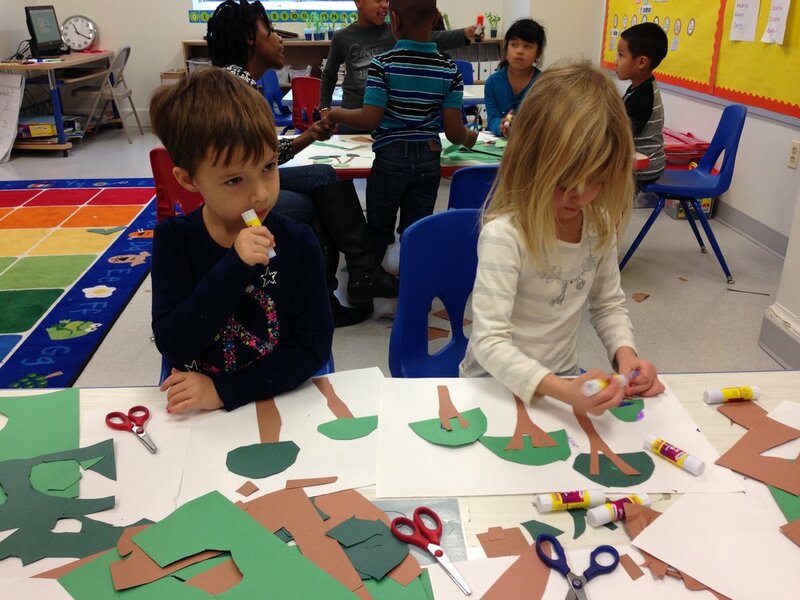 During Study Topic time children will engage in inquiry-based studies based on Science and Socials Studies standards. Social Studies study topics will revolve around historical, civic or geographic focuses supported by the Social Studies Alive curriculum resource. Science studies will engage in inquiry-based studies using the Full Options Science Systems (FOSS) science curriculum resource. Bridges uses The Readers and Writer's Workshop approach for instruction in English Language Arts. The Readers Workshop instructional method emphasizes the interaction between readers and text. Students learn to ask questions as they read, making connections with their prior knowledge. Readers Workshop also focuses on discussions with peer and teacher conferences building independent reading skills that students can transfer and use outside of the classroom. The components of Readers Workshop include: mini-lessons on a reading strategy or strategy for making meaning from a text; independent reading time, journaling to respond to literature; teacher / student conferences and guided reading with a teacher individually or in a small group. The Writers Workshop model encourage students to write by making the process of writing a meaningful part of the curriculum through various daily activities. Each writing unit intentionally introduces a practice that good writers do and give students opportunities to practice pre-writing and writing activities with specific focus. Students begin Writers Workshop in kindergarten using pictures to generate ideas for stories. In later grades, writing ideas out and learning to plan for writing by writing becomes the focus. Students are able to choose the topics they write about and engage in peer conferencing as part of the creative process. Writers Workshop includes story planning, revision, teacher/student editing and direct instruction in grammar and English writing conventions. The format of Writers Workshop is similar to Readers Workshop and includes: a Mini-Lesson to focus on an aspect of good writing; independent writing time and sharing with a peer. Student's writing goes through the process of creating a first draft, revision, illustration, final editing, and publishing. Both Readers and Writers Workshop have celebrations to display and recognize learning that has occurred at the end of each unit. Go Math! Lessons are designed to fully activate conceptual development, as students work from introduction to mastery of each math standard. Throughout the lessons, students will use manipulaitves, models, quick pictures, and symbols as they apply Mathematical Practices to build understanding. Students are actively engaged in reasoning during instruction, so they are prepared to use the math skill in real world settings. Second Steps is a school-wide social-emotional curriculum. This curriculum teaches skills to build self-regulation and social-emotional competence, both important for kindergarten readiness and school and life success. Children learn and practice vital skills for listening and paying attention, having empathy, managing emotions, building friendships and solving problems with others. The Second Step curriculum was designed to reduce behavior problems, improve classroom climate by building feelings of inclusiveness and respect, and increase children’s sense of confidence and responsibility.